The complexity of peace operations is rapidly increasing, thus requiring the United Nations to purposefully reorient its efforts to better address the needs on the ground. g international standards related to weapons and ammunition management. 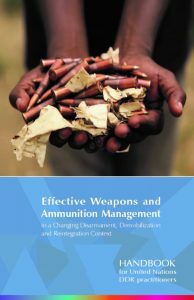 As Under-Secretaries-General Izumi Nakamitsu (ODA) and Jean-Pierre Lacroix (DPKO) noted in their joint foreword to the handbook, weapons and ammunition management has become a crucial component of the United Nations’ work in post-conflict environments, including in the framework of DDR programmes. United Nations DDR professionals across the world are increasingly required to operate in complex environments characterized by political instability, acute violence, diverse armed actors and a prevalence of weapons, ammunition and explosives. The DPKO-ODA handbook provides DDR practitioners with practical guidance on how to design and implement state-of-the-art weapons and ammunition management operations in DDR programmes – including as part of innovative Community Violence Reduction (CVR) approaches – that take into consideration the most recent international standards and guidelines. In this regard, the International Small Arms Control Standards (ISACS) and the International Ammunition Technical Guidelines (IATG) represent fundamental components of the handbook and are referenced throughout. The handbook underwent several rounds of internal and external review, and was developed in close consultations with DDR practitioners currently deployed in peace operations. The publication demonstrates the ongoing efforts by the United Nations System to increase the effectiveness of peace operations and to support the international community in implementing the comprehensive 2030 Agenda for Sustainable Development. Through this initiative, DPKO and ODA seek to support States in achieving the Sustainable Development Goals, in particular Goal 16 on peace, justice and strong institutions. The material in the handbook directly addresses target 16.1, on reduction of all forms of violence; 16.4 related to a significant reduction of illicit arms flows; and 16.A on strengthening national institutions for building capacity for preventing violence and combating terrorism and crime. ODA and DPKO look forward to the next phase of their joint work during which a training course will be developed based on the handbook for roll-out at the United Nations Regional Centre for Peace and Disarmament in Africa (UNREC) in 2018. The handbook and training course will also inform the ongoing revision of the Integrated DDR Standards (IDDRS), a process launched by the Inter-Agency Working Group (IAWG) on DDR in 2016. The handbook is available as a PDF download here. For hard copies of the handbook and for any other queries, please contact conventionalarms-unoda@un.org.